The New Jersey Organizing Project is a marvel. This Jersey Shore grassroots group was born after Hurricane Sandy when neighbors in towns like Stafford, Brick and Seaside Heights came together to rebuild homes and lives, with a little help from their friends. No one embodies this resilience more than NJOP’s co-founder, Joe Mangino. This wildlife biologist and small-business owner unexpectedly became a community activist when his own home was destroyed by the storm. He immediately started helping his neighbors, ripping out drywall and helping to gut and rebuild over 800 homes, saving taxpayers $4 million in cleanup costs. When Governor Christie failed to deliver aid to Sandy survivors, leaving many still homeless, Mangino went to Iowa to publicly confront the then-candidate for president about his unkept promises. Mangino and the NJOP have since won fifteen million dollars in rental assistance, helped pass a bipartisan bill to prevent foreclosures, and are now fighting to unlock $1.3 billion in Sandy aid that New Jersey has yet to disburse. 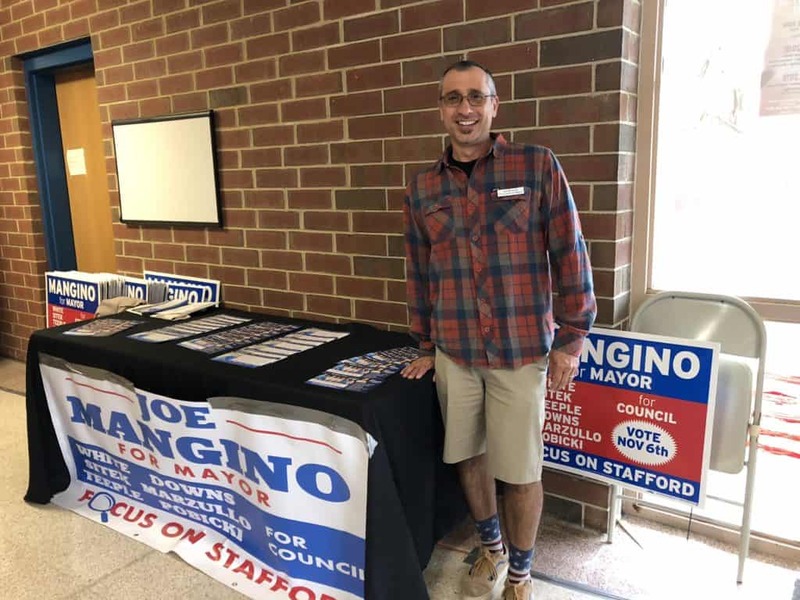 Now Joe is running for mayor of Stafford, his hometown: the local Democratic Party club, and the current mayor, John Spodofora – a Republican – encouraged him to run, based on his advocacy. So now Mangino, the accidental activist and a lifelong Independent, is an accidental candidate. We caught up with Mangino at the NJOP’s first annual convention on Manahawkin, NJ, to talk about what’s next for the organization and his candidacy. Joe is smart, sincere, and undeniably cool. Dressed in beach-casual shorts and American-flag socks in the October chill, he told me about the NJOP, his run for mayor and the challenges Sandy survivors still face, six years after the storm. OF: How did you find yourself running for mayor of Stafford? “After the primary, people were kind of scared about the team that won. They were running on national issues, things that don’t necessarily affect Stafford Township. A lot of residents were very concerned about that, because they’re worried about who’s going to pick up their trash, who’s going to plow the roads, how much are they going to pay in taxes. A lot of people reached out to me because they know I’ve been active in the community, kind of urging me to get involved in this race, to run for either council or mayor. The Democrats reached out to me because there was an open spot, and they felt that because of some name recognition and the work I’ve done in the community, they felt I would be a good candidate for Mayor of Stafford. I gave it careful thought, and knowing how much I love this town and I don’t want see it go backwards, I want someone who’s going to take it into the future in a positive way, I felt like, well, I’m the guy who’s going to do it – so I jumped into the race, and here I am. OF: How does running for office relate to your work with NJOP and your goals? My experience and the things I’ve learned through NJOP have helped prepare me for this next step, to become mayor of Stafford. Honestly, prior to everything I’ve gone through with Sandy, I was a pretty introverted guy – still am – so to me this is a challenge. But we can’t make good change without challenging ourselves. For me, this is just another challenge that I’m willing to accept because I know I’m going to grow, and that growth becomes positive growth for the town, because I have nothing but good intentions. I’ve been invested in this town, I just want to make sure that the people of Stafford get put first, and the only way we can do that is by putting party politics aside so everybody knows I’m all about the people first here in Stafford. OF: What are the top challenges faced by Stafford and other survivors along the Jersey Shore? “For us, it’s being prepared for the next storm. Extreme weather, sea level rise and climate change are huge issues in our community. Our tourism industry is very important, so we need to make sure that we’re prepared for the next event, whether it’s the next Sandy or just the continuing rising of the seas. We’re seeing it right now – we have a high tide that’s flooding the streets, and there are no storms around. So preparedness is very important. Two is taxes, and making sure that our residents can afford to stay here, live here peacefully, and not struggle. A lot of our residents are fixed-income seniors, so they’re worried about cuts to Medicaid and Medicare. So we want to make sure that not only are their property taxes are reasonable, but they can have other services they need to have a decent life here in Stafford. OF: How does this relate to the bigger fights in your congressional district and the state? Right now, we have to make sure that we elect the right people, who are going to stand up and represent what we want. Right now in New Jersey there are some pretty extreme people who want to take health care away from people, who aren’t fighting for us when it comes to reforms for flood insurance, which is a big issue around here. So, yes – part of the work we do with NJOP is educating the people on the issues so they can in turn see who the right choice may be. So we’re trying to get that message out: educate on who the right candidate is, who is the right group you can work with. And if you want to share your voice, come to a group like the New Jersey Organizing Project. Because we can put all those voices together and speak very loudly. You’re at the top of a slate, what does it mean to be doing politics differently in New Jersey and engaging people in the process? “This is the first time I’ve run a campaign. I would never consider myself a politician, I’ll never have to call myself a politician, so they way I’m approaching this is how I’ve done everything in life, and over the last few years: I get the community involved. I need their voices, because this isn’t just me, and that my council would be running Stafford Township – this is the people running Stafford Township. What’s nice about our ticket is it is a diverse ticket. For the council candidates have three men and three women. We all come from different age groups and different backgrounds – two lawyers, a tax advocate, an information technology specialist, a retired teacher, and I have quite a diverse background myself on all the various things I do, especially with my volunteer work and community organizing. So we represent a bunch of different areas where we have expertise. What brings us together is we’re all community oriented: we’re always looking for the best interests in our community, we’re always volunteering our time, trying to make a positive impact in town. You know what you need – I can’t just sit there and come up with ideas and say, “hey, this is great for the town” – you have to tell me what’s good. But then I’m going to challenge you to get involved and help us in that process, bringing this town forward, to satisfy your needs and make sure everyone is treated equally and fairly in Stafford Township.